Employee Income of Hospitality & Tourism Industry Cluster | Propel L.A. 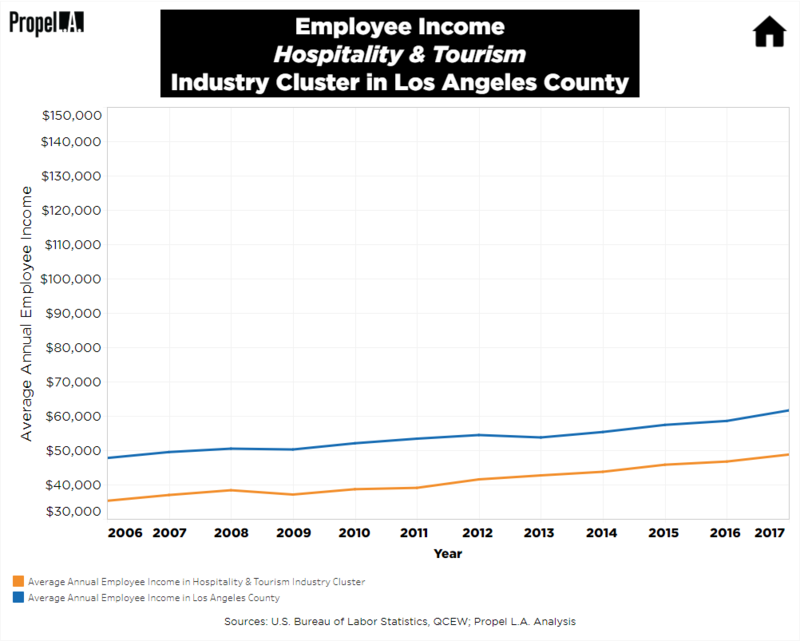 In Los Angeles County, the average worker in the Hospitality & Tourism industry cluster (“Hospitality”) has historically made about $10,000 less than the the average worker in any occupation. In addition, the industry cluster’s average wage of $48,735 in 2017 is enough to cover the living wage ($28,163) needed for a single individual to cover their basic needs in Los Angeles County, but it is not enough for a single working individual to provide for themself and a child ($60,840). What is the Hospitality and Tourism industry cluster? The Hospitality industry cluster is a key traded industry cluster in Los Angeles County. Some sample industries within the cluster are Accommodation (NAICS 721), Travel Arrangement and Reservation Services (NAICS 5615), Spectator Sports (NAICS 7112), Museum, Historical Sites and Similar Institutions (NAICS 7121), Amusement Parks and Arcades (NAICS 7131), Gambling Industries (NAICS 7132), and All Other Amusement Parks and Arcades (NAICS 71399) (Institute for Applied Economics, LAEDC, February 2018). This industry cluster is responsible for hosting the large influx of visitors and tourists that Los Angeles County regularly receives. To learn more about the Hospitality industry cluster, you can click here. What is an industry cluster? An industry cluster is “a regional concentration of related industries in a particular location. Clusters are a striking feature of economies, making regions uniquely competitive for jobs and private investment. They consist of companies, suppliers, and service providers, as well as government agencies and other institutions that provide specialized training and education, information, research, and technical support” (Institute for Strategy and Competitiveness, Harvard Business School, n.d.). There are two types of industry clusters: traded and local. A traded cluster serves markets beyond the region in which they are located. Economists recognize traded clusters as “engines” of regional economies that allow a region to reach high levels of overall economic performance. A local cluster, on the other hand, only serves the local market in which the region is located. Average annual income was calculated in nominal wage by taking the weighted average of all private wages in the selected NAICS industries. NAICS industries were selected by using the definition of the industry cluster produced by the Cluster Mapping Project (CMP) developed by the Harvard Business School (Institute for Applied Economics, LAEDC, February 2018). Due to large population size of NAICS industries in the Hospitality cluster, Propel L.A. selected a few through random sampling to represent this particular cluster. The summary of results may be slightly biased due to the NAICS industries being nonexhaustive. Annual living wage is determined by the MIT Living Wage Calculator under the assumption that an individual works full-time at 2,080 hours a year.